Learn the different inversions of 4th chords on the middle four strings, and work on learning the chord scales associated with these chords. When learning how to play jazz guitar chords, one of the first voicings many of us explore are three- and four-note 4th chords. Built by stacking 4th intervals, these chords have a modern, “open” sound that has been a favorite of players such as Lenny Breau, Mike Stern and Kurt Rosenwinkel, helping to define their chordal approach to jazz comping and chord soloing. While the root-position 4th chords are commonly used and studied by many beginning and intermediate jazz guitarists, the inversions of these chords are less commonly used, though they can also offer a modern twist to your soloing and comping ideas. In this lesson we’ll be exploring the different inversions of 4th chords on the middle four strings, and working on learning the chord scales associated with these chords. In this first example, you can see a chord scale derived from the 4th-chords found in the key of D major. For those of you who have explored 4th chords before in your practicing and performing, these are the chord shapes you have probably come across in your studies. If you’re new to the concept of stacked 4th intervals, and 4th chords, then working on these root-position voicings is a good introduction to these important and commonly used jazz chords. Start by playing through the example below. Then try taking these voicings to different string sets, and to different keys in order to take them further in the woodshed. Once you’ve checked out this example in a few string sets and in a few keys, move on to the more unorthodox 4th chord fingerings in the examples below. Just as you can work out inversions for other common jazz guitar chords, such as Drop 2 and Drop 3 chords, you can work out inversions for 4th chords as well. In the following example, you can see the first chord of the above chord scale, Em7, written out using the three possible inversions, root-1st-second-root, on the middle three strings of the guitar. When looking at the different inversions, you can see that the root position chord is built by stacking 4th intervals, while the other two chords are a mix of 4ths and 2nds. Here is a reference chart that you can use to learn the different interval patterns for each inversion of 3-note 4th-chords. 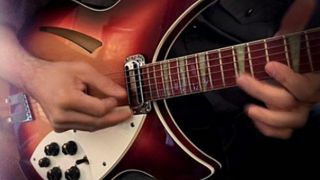 Before moving on to the inversion-based chord scales below, try playing through these shapes in different keys and on different string sets in order to get the sound and feel of these chords under your fingers and in your ears. which will make learning the chord scales much easier when you check them out in the woodshed. In the following chord scale, you can see the chords from the key of D major written out in first-inversion. This chord scale is built by playing a first-inversion Bm7 chord, the lowest in the key of D major that’s possible to play on this string set, and then playing up the scale from there. Experiment with playing this chord scale at different tempos, on different string sets and in different keys to get this sound in your ears and under your fingers. When you’re ready, you can also bring these chords into your comping, chord melody and chord soloing over blues, standards and other tunes you are working on in the practice room. Here is the chord-scale that uses second-inversion 4th-chords in the key of D major. Again, it as built by playing a second-inversion Gmaj7 chord, 7-R-4, and then moving up the scale from there on the middle three strings of the guitar. Once you have worked on all three chord scales, try playing them back to back, or moving between each chord scale in your comping and chord soloing to further integrate each chord inversion in your playing. While many of us have checked out root-position 4th chords, which are commonly used in the jazz guitar idiom, there also is a wealth of information to be gained from studying the inversions of these modern-sounding jazz guitar chord voicings.